I am dried off from the record-setting rains of Sunbelt XXV and ready to start reflecting... about this weekend's big Oscar hoo-ha (sort of). Some of the things I like about social network analysis include (1) using something fundamentally simple like a set of nodes and edges to illuminate very complex behavior, and (2) producing powerful images that convey social dynamics very intuitively. James Moody demonstrated both these points spectacularly in his Freeman Award Presentation. Moody was recognized at Sunbelt XXV as the most outstanding young researcher in SNA. Moody described a simple principle involving three individuals, A, B, and C: If A likes B, and B likes C, then A will probably also like C. Otherwise (if A does not like C) things can get tense between friends A and B, producing social instability. Using little more than this principle of transitivity (also known as clustering), Moody has built a social network model that behaves with an amazingly lifelike quality. If you've got broadband, then I recommend you get some popcorn and take a look at this movie (18MB). The nodes and edges do an amazing job of conveying the dynamics of a cocktail party. And even more amazing is the simplicity of the model behind this behavior. Bravo! To see the other movies nominated for "Best Network Visualization," take a look at "Dynamic Network Visualization" by Moody, Daniel McFarland, and Skye Bender-deMoll. A few weeks ago at KM Cluster I met Robin Athey, who leads Deloitte's research on organizational performance. We talked about how companies manage their critical talent, those exceptional people who know how to make things happen. Deloitte has just published Robin's excellent white paper on this topic: "It's 2008: Do You Know Where Your Talent Is?" Note that "critical talent" rarely refers to the highest paid executives. More often critical talents are people like scientists at pharmaceutical companies, inventory managers in retail firms, or drivers for UPS. Critical talent is scarce and is only getting more so. Companies traditionally search for critical talent amongst the ranks of their competitors, promoting a culture of Acquire (get talent) & Retain (keep it). Robin notes, "The typical U.S. company spends nearly 50 times more to recruit a $100K professional than it will invest in his annual training after he comes aboard," with similarly skewed efforts at retention. 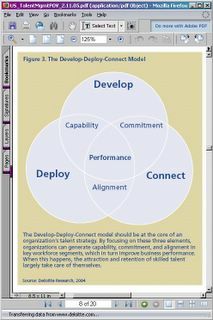 She continues, "As a result, by focusing on the end points of managing talent (acquisition and retention) rather than on the middle ones (deployment and development), organizations ignore the things that matter most to employees. When this happens, companies set themselves up for inevitable churn, which becomes especially hazardous in a tight labor market." Of course there's a lot more to it than the above chart. I recommend you read Robin's report for more. For more about connecting in this context, Robin points to the work of Rob Cross and Wayne Baker, to which I would add Ron Burt. I'm back from the sadly misnamed Sunbelt XXV, which was visited by buckets and buckets of rain. I will have a lot to say about this conference in coming days. But I'm going to hold off on networks for just another day or so. I'm a bit overdosed on academic discussions of multiple regressions and still getting my feet back on solid (albeit snow-covered) ground. When I get going again, one topic I will be sure to discuss is visualization. For now, I will start the visualizing by pointing you to the art gallery run by my friend Niccolo Brooker, on the other side of town from Sunbelt XXV. Niccolo represents the world's best contemporary representational artists. My favorite of this ilk is the aptly-named Odd Nerdrum. My PC gets the rest of the week off while I fly to southern California to enjoy Sunbelt XXV. Look for more from Connectedness after I return next Tuesday. And if you're going to Sunbelt yourself, please do look me up while you're there. As part of my final preparations for Sunbelt XXV, I watched a dramatic treatment of infection networks. 28 Days Later is the modern-day story of a "rage" virus that turns victims into white-eyed stomping monsters. Infection happens through blood and saliva, generally after being bitten by a zombie. Upon being bitten, the victim is zombified within 10 screaming seconds or so, apparently with 100% transmission rate. I was expecting a lot more flesh-eating in this movie, but I am pleased to report it's classier than that. When all of Great Britain turns zombie but a handful of survivors, even the uninfected start acting crazy. From a networker's perspective, the rage virus featured in "28 Days Later" does not look so scary. To be a serious world-beater, an infectious pathogen must not only be lethal but also must get around. To do so, it must attach itself to a carrier-host who can then pass it to as many more hosts as possible before death befalls the carrier-host. Knowing this, we can see that the rage virus is entirely too obvious. When a carrier-host becomes a zombie ten seconds after infection, he pretty much gives away his infectious status and enables the uninfected an easy way to tell friend from foe. Note further that these zombies, being more sick than truly undead, are quite susceptible to bullets, knives, machetes, baseball bats, and other weapons. So you can probably imagine how the uninfected hold on and eventually manage to contain their losses. When infection networks include carriers who look healthy but are actually spreading ultimately deadly pathogens, then things get really scary. Thanks to spinster for alerting me to musicplasma (and OSN2005 for cluing me in to spinster). 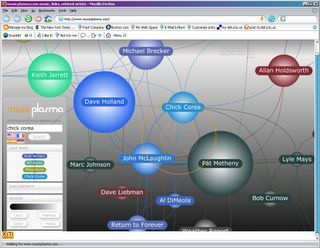 As spinster so rightly points out, there is serious potential synergy between network visualization tools and collective filters (such as LastFM in this case; see also social bookmarks). For example, suppose I could inform musicplasma that as much as I love Chick Corea, I am not a Pat Metheny fan. And then suppose musicplasma could update the visual network to suggest not just who is related to whom, but where my interests are likely to fit in with that network. Yesterday I visited with Steve Borgatti, professor of Organizational Studies at Boston College. The first thing Steve and I started talking about has really stuck with me -- that organizations can benefit from simply being aware of the power of networks, without actually doing any network analysis. Steve calls this the "network perspective." At any rate, Steve's work has been invaluable to my own. Not only is he a leading scholar in social network analysis, but he's also assembled the best collection of online SNA resources you can get without a prescription. Now I am looking forward to chewing on another exemplary online syllabus compiled by Steve, this time for an MBA-oriented class entitled "Organizational Social Networks." This syllabus, being more business-focused and less academic, is actually even more in line with Connectedness themes than the summer school syllabus. I highly recommend you check it out. And for more insight related to the network perspective, see "systems thinking" (e.g., Senge). I've been deep into survey administration the last couple months. For more about the project history, see my previous posts on Six Sigma Church, which we now officially call Renewing Our Calling. Our project included a major survey which we made available on paper and online for the whole congregation (roughly 400-500 people). We just finished collecting responses and were happy to get 167 of them. You can try a dummy version of survey right here. We used SurveyMonkey to support the online survey. This is an amazingly powerful service and it's cheap, too. In many situations you can use it for free. We needed the "professional" version which is still a steal at $20 per month. Many of my readers are probably especially interested in administering social network analysis surveys. To help you along, I recommend two resources. First, check out The Hidden Power of Social Networks by Rob Cross and Andrew Parker, which includes a sample survey form in an appendix. Then, read "Ethical and Strategic Issues in Organizational Social Network Analysis," by Steve Borgatti and Jose Luis Molina, who explain the delicacy of administering a social network survey, which by its very nature lacks the safeguard of anonymity we usually expect. Based on these two resources, here is a generic social network survey I have written, which you may find helpful. And finally, go take this survey, commissioned by the National Research Council to "study the possibility of identifying 'Network Science' as a cross-disciplinary area of research worthy of enhanced attention and funding." Here comes Online Social Network Conference 2005 (OSN2005), Feb 9-23. "OSN2005 will be a summit for all those interested in working with social networking processes, tools, and media. In addition to attending many workshops, panels, and presentations by leading experts and practitioners, attendees will have the opportunity to be part of a community with a significant role in defining the future direction of online social networking. If you want to help shape this industry, come to OSN2005! "During the OSN2005 summit we will co-create and publish a manifesto describing what we want and need from online social networking tools. What are the key criteria for choosing and assessing OSN products and services? What gaps exist in currently available software and related tools? What needs to happen before it's common knowledge that OSN products and services can deliver significant value? What are the most promising developments in the OSN industry? "Attendees will be invited to participate in a series of focus groups to provide feedback on current OSN technology and articulate specific suggestions for future features and developments. A series of White papers based on these focus groups will be shared with venture investors who want to know where to place their bets in this industry. "Anyone involved in communicating or collaborating online should register today for Online Social Networks 2005." Feb 1 is the last day you can register for $35, after which registration costs $50.